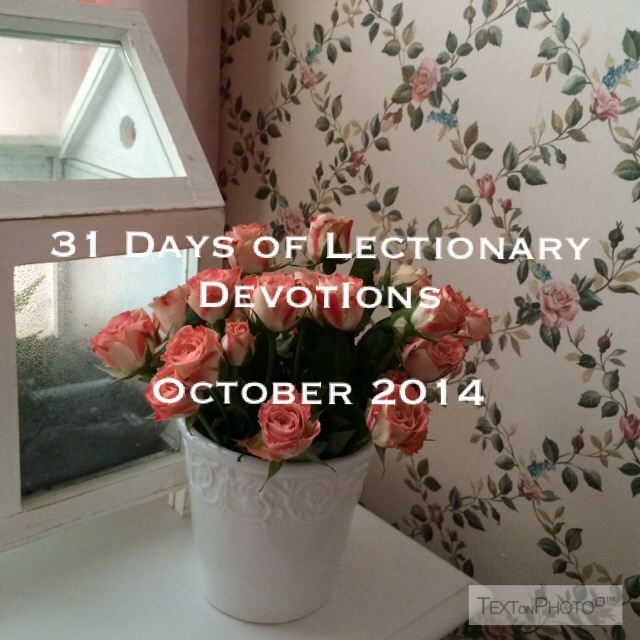 For October 2014 I am starting a new series of devotions for each day based on the Lectionary readings. For those of you not familiar with the Lectionary, it is a way that Christians have broken the Bible up into theme related texts that are used in many Churches around the world. I am following the Revised Common Lectionary. If your Church uses the Lectionary it is the source for the Sunday Bible readings and sermon, so you may hear these topics covered in more depth in worship on Sunday. I hope that it will be a way that many people can enjoy thinking more deeply about the Bible by reflecting on topics throughout the week. Each day as I post the link I will add it to this page so that someone who stumbles upon it in May can easily find the reflections all on a particular topic. Each day you will need to click on the link for that day. On the positive side the Lectionary runs in three-year cycles, so in 2017, you can also find reflections on what will be again the daily texts. I am not posting the actual Bible texts for each day, as that will make the posts unduly lengthy. You may choose the translation of your choice or link to a Lectionary reading update, such as the one below.